Santo Daime is a syncretic spiritual practice, which was founded in the Brazilian Amazonian state of Acre in the 1930s and became a worldwide movement in the 1990s. Santo Daime rituals involve collective singing of hymns, sometimes while engaged in a formalised dance step, other times simply seated in chairs, combined with the consumption of Daime, the name founder Raimundo Irineu Serra, or Mestre Irineu gave to the drink known generically as Ayahuasca. Dai-me means “give me” in Portuguese, as in “daime força, daime amor” (give me strength, give me love), phrases found in several of the doctrine’s hymns. Santo Daime is syncretic in that it incorporates elements of several religious or spiritual traditions including African Animism, South American Shamanism, and Christianity. The religion, called simply the Doctrine of Mestre Irineu by its most senior practitioners, has little basis in written texts. Instead, its teachings are learned experientially, through singing of inspired hymns, which explore perennial values of love, harmony and strength through through poetic and metaphorical imagery. Ceremonies, which are called trabalhos meaning “works”, are typically several hours long and consist of drinking Daime and either sitting or dancing while singing hymns and playing maracas, or sitting in silent concentration. The drinking of Daime induces a strong emetic effect which is embraced as a purging of both emotional and physical impurities. Overall the Santo Daime promotes a wholesome lifestyle in conformity with Mestre Irineu’s motto of “harmony, love, truth and justice”, as well as other key doctrinal values such as strength, humility, fraternity and purity of heart. Ayahuasca, which contains the psychoactive compound dimethyltryptamine (DMT), has been the subject of increasing legal scrutiny in the last few decades as Santo Daime has expanded. The decoction has been explicitly legal for religious use in Brazil since 1986, while recent legal battles in Europe have legalized its use in Holland and Spain. In the United States, the Supreme Court in 2006 upheld a preliminary injunction permitting another Brazilian church, the União do Vegetal (UDV), to use ayahuasca ritually. This decision, as the result of specific litigation involving the UDV, applies only to that group, so the legal status of ayahuasca generally remains in a gray area in that country. Santo Daime is the name given to the religious practice begun in the 1920s in the far western Brazilian state (then-territory) of Acre by Raimundo Irineu Serra, an immigrant of Maranhao in Brazil’s northeast region. Irineu Serra was born in Brazil in 1892 to African parents. Inineu migrated to the Western Amazon region in 1912, attracted to a boom in the rubber tapping industry. He first drank ayahuasca in the border region between Brazil, Bolivia, and Peru. After experiencing a series of visions whilst spending 8 days in solitude in the forest, he began to conduct spiritual ceremonies using Ayahuasca. Many people came to him sick, seeking healing they could not afford or failed to find in standard medical practice. Devotional in context, the songs praise divine principles. The Cross of Caravacca, with its double horizontal beam, stands on the altar. Each session begins and ends with Christian prayers. Santo Daime practice features several kinds of ritual: two kinds are concentrações (“concentrations”) and bailados (“dances”), also known as hinários (“hymnals”). Other rituals focus on the saying of the rosary, or healing. Participants drink Daime in all types of ritual; but the format and focus can differ; concentrations are silent, seated meditations, while hymnals involve dancing and singing hymns while playing maracas. The Christian core is combined with other elements, such as an emphasis on personal gnosis and responsibility, an animist appreciation of nature, such as the Sun, Moon and Stars, as well as the totemic symbol of the ‘beija-flor’, the hummingbird. Spiritual beings from indigenous Amazonian shamanism and deities from the African pantheon such as Ogum and Iemanja are also incorporated into the doctrine. The nature of the work is sometimes personified and addressed as ‘Juramidam’, a name disclosed to Irineu in his visionary experience, which means literally, “God (jura) and his soldiers (midam)”. Participants in the ritual come to submit themselves to a process through which they may learn things. This may include various wonders – Ayahuasca is famous for the visions it generates, and the sense of communion with nature and spiritual reality – as well as more mundane, less pleasant lessons about oneself. The Daime is thought to reveal both positive and various negative or unresolved aspects of the individual, sometimes resulting in difficult or blissful ‘passages’ involving the integration of this dissociated psychological content. It is not for nothing that ceremonies are referred to as ‘works’ since they can last up to 12 hours. The effects of Daime combined with dancing, singing and concentration require and develop stamina or ‘firmeza’ – firmness. The essential teachings of the Doctrine are transmitted through the hymns, which, when sung, create a direct link to the astral and the Divine. Master Irineu received 129 hymns within his hinario, or hymnal, and his hinario marks his spiritual journey and evolution from when he began drinking the Daime until his death. Through the singing of his hymns, the participant is able to connect with the spirit, teachings, and salvation of the Master and, in many ways, begin walking the same spiritual path which the Master walked. Hymns are often received as direct transmissions from the astral, and it is through the singing of hymns that teachings of the Master, Padrinhos, and Madrinhas are passed to the members. Through the force of the sacrament, the hymns become living testimony and bring specific energies of healing, strength, communion, forgiveness, and remembrance. Many members of the church receive hymns, and there are literally thousands of hymns throughout the Doctrine. The singing of particular hinarios conicides with official dates on the Santo Daime calender, which includes the singing of the Master’s hinario on the Virgin of Conception (Dec. 7), Christmas, Day of Kings (January 6th), St. John (June 23rd). The hinario of Padrinho Sebastiao is sung on Master Irineu’s birthday (Dec. 15), Saint Sebastian (January 19th), Madrinha Rita’s birthday (June 25), as well as Brazilian Father’s Day. Padrinho Alfredo’s hinario is sung on Padrinho Alfredo’s birthday (January 8), St. Joseph (March 18th), and Saint Peter (June 28th), as well as New Year’s Eve (December 31st). Non-Portuguese-speaking members often “receive” hymns in their native language. The death of Mestre Irineu in 1971 resulted in a diversification within the Santo Daime community. From a global perspective, the most significant of these occurred when Sebastiao Mota de Melo, commonly called Padrinho Sebastiao, left the original center with a large group of his followers, and formed a group known as CEFLURIS. According to church documents, this split also entailed disagreement over the use of cannabis. Followers of Sebastiao Mota de Melo believed marijuana to be a healing plant teacher, and referred to it as Santa Maria, using it in ceremony to help their mediumship (embodying of spirits for the purpose of healing.) Followers of Mestre Irineu regard use of cannabis, as well as mediumship generally, as outside the doctrine. In the early 1980s Padrinho Sebastiao moved the church headquarters to Ceu do Mapia. Control of CEFLURIS was increasingly shared with the southern intellectuals who joined the movement in the 1970s, and in the 1980s CEFLURIS established centers in southern Brazil. The group now has affiliates in North America, Europe, and Japan, as well as throughout Brazil. Santo Daime’s entheogenic sacrament, ayahuasca, has been used for millennia in South American indigenous cultures. 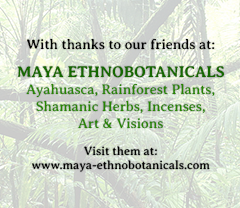 It is one of the traditional tools of the shaman in South America, and in many regions is to this day a common medicine used for finding and treating various ailments as well as for its vision-inducing effects, which are said to be profound and life-changing. The tea has had many names including Santo Daime (or simply Daime), Hoasca, Ayahuasca, Yage, and Caapi. It is made from two or more plants, one a woody vine (Ayahuasca vine or Jagube; generally b. caapi), and the others known as admixtures. While various plants are used throughout South America, most of which have high concentrations of dimethyltryptamine, the preferred admixture in the case of Santo Daime is Psychotria viridis, known to church members as the “Queen of the Forest,” after the figure who is said to have appeared to the church’s founder in a vision, prompting him to start the religion. The Santo Daime Church uses only the Jagube vine and the Viridis leaf, not adding any other plants to the mixture. The tea is prepared ceremoniously over a week by members of the church in a festival called a ‘fetio’. Hymns are sung, and Daime is drank while the men hammer the vine into powder and the women clean and sort the leaves. Because of the very specific manner in which they prepare their sacrament, and the very specific way in which they use it, the beverage is not called ‘Ayahuasca’, but ‘Santo Daime’. Due to their usage of ayahuasca as a sacrament and the spread of the religion, Santo Daime has found itself the center of Court battles and legal wrangling in various countries. In Brazil, CONFEN (the Federal Drug Council) has consistently upheld the right of the Daime Church to practice its religion and healing practices using the Daime. A study was made of the Daime by the CONFEN in 1987 which included visits to the various churches and observation of the making of the Daime. It also included study of another group of Ayahuasca users, who call the drink Vegetal (Uniao do Vegetal). The work group which made the study included representatives not only of the CONFEN but also of several other government agencies. The conclusion of the study was that the Daime was a very positive influence in the community, encouraging social harmony and personal integration. The study noted that, rather than simply considering the pharmacological analysis of the plants, it was essential to consider the whole context of the use of the tea — religious, social, and cultural. In France, Santo Daime won a court case allowing them to use the tea in early 2005; however, they were not allowed an exception for religious purposes, but rather for the simple reason that they did not perform chemical extractions to end up with pure DMT and harmala and the plants used were not scheduled. Four months after the court victory, the common ingredients of Ayahuasca as well as harmala were declared stupéfiants, or narcotic schedule I substances, making the Daime and its ingredients illegal to use or possess. See  and  (French) for more information. In the United States, court battles over ritual use of Ayahuasca have mostly been fought by the UDV, and practitioners of the Santo Daime doctrine are watching these events closely. So far, UDV has been able to continue practicing legally thanks to Supreme Court decisions that soundly rejected attempts by the government to prohibit it. see  for more information. The most recent decision came in Italy in 2006; an eight month long investigation had led to the arrest of 24 Italian Santo Daime members in early 2005, but the May 2006 ruling found that no sufficient evidence had been presented to demonstrate that the church members had broken Italian law. Two particularly important research projects are worth highlighting. The first is the official investigation made by the Brazilian government at the end of the 1980’s, which resulted in the legalization of the religious use of ayahuasca in Brazil in 1992. The second is ‘The Hoasca Project’ developed by a collective of international scholars. The Hoasca Project presented important findings regarding the use of Ayahuasca as an agent of healing, something it is famous for in its indigenous context. If you are formatting your texts according to a manual like APA or MLA you should cite yourself. I just saw a documentary on Daime. I was floored because I realized that there was a spot in Christianity for mind-expansion through Daime. I have always had the same kind of belief structure. I am a Christian, but I think that through the use of Daime, we can become more in tune with the current of the Universe and more fully know God. Please let me know if there are any Daime churches in Central Texas, so I can make contact with them. I’t is one thing to believe in God and Jesus Christ and another altogether to know God and Jesus Christ. The Daime allows one to know the truth. To have met our Lord and then to be forgiven for past sins so as to be able to experience Our Infinite Golden Cosmic Self is the greatest gift one may have. The other devine beings of the astral I salute and give my love. To meet Dragons and Lord Ganesh among others during works is a blessing beyond compare. Thank you forever Santo Daime. Hello All! I am extremely interested in getting involved in this church. I’m currently living in southern California and I haven’t been able to find any churches like this close by. If there aren’t any aound here do I have to move to an area where this church exists or is there any way I can participate from a distance and visit periodically to attend services? I contacted the UDV and they said that I must live in the community where the church was located in order to be a member of the church. Is this the same for Santo Daime? I am not currently in any position to move to Santa Fe or Oregon but I really want to become a member of one of these churches somehow. Is there any talk of one opening up in Southern California or am I SOL for now? i am interested in experiencing the plant medicine of santo daime. i also live in portland, and am curious if anyone could point me in the direction of local resources. @LuLu. How went with your work? God bless you. i’m happy for you if you have found the path. I was raised strictly Catholic in Italy. When I grew up I refused it. I was Interested in shamanism but I was not satisfied with it feeling this interest was somewhat narcisistic, simplistic, decadent, a little messed-up and potentially dangerous. Then i met Santo Daime for God’s ways are infinite… That’s all about it. I’m a new Man. I’m learning everyday more. I reconciliated with God and Jesus Christ who was the greatest shaman in the history of Universe. Thank you forever Santo Daime, thank You God, thank you Mestre Irineu, Meu Mestre Império JURAMIDAM! I do not know if you have found it but there is a church in Wimberly. If you want more info my e-mail is ktc13@live.com. Would greatly appreciate any information on Santo Daime in Boston ma or surrounding areas…..
I’m an artist and musician living in Bristol in the UK, I’m interested in visonary medicine and personal development. If there is a Santo Daime group in the west of England I’d be very glad to find a connection. I’m happy to show some art/music to verify my background and intent if it helps! correcting it, if only here. This is part of the Decree of Mestre Irineu, 1970. Ayahuasca is legal in Spain correct? Does anybody know of a center, UDV or Santo Daime that I could try to get in contact with? Preferably in the south of Spain but where I must go is fine. Can I just go there or do I have to go with a member already? Do you have a center/group/ office in California? Please email me your address, email and phone number. Very interested in the spiritual use of plant medicines. Can you tell me the closest location in the US. I am located in New York. Do anybody know where i can find a Santo Daime Church in northern California, or somewhere in California. I was raised Catholic but i feel that a syncrenation of shamanism and Catholicism would work well.Anything in UK ? An “Entheogen” is a drug that lets you see God – Do we really need drugs to perceive our Creator? Looking for a place of worship in San Francisco area. Any help would be appreciated. I am vert interested in learning more about Santo Daime after seeing a documentary on Pay-Per-View last night. I’ve watched is several times already. I live in San Diego, CA – but I cannot locate any information on any churches here in California, even though I suspect there are some. If anyone has any information and can email me at: robsull75@yahoo.com – I would be eternally grateful. Ola a todos que Deus esteja com todos. Estou muito interessado em experimentar esta planta,tem alguma igreja aqui em uk England. Hi I would like to know if is any santo daime church here in uk. Hello,My Husband and I have been doing research and wanted to find out how we could Join? We have been Spiritual Ministers for over 13 years and Holistic therapy would love to start a church again where we moved or be with another one that Practice the ayahuasca Tea and Christ Plus we have Euphoria Music we Do for a Higher Place to enter.. We live in Lago Vista TX 40 min out of Austin TX we live in the Hill country is there any place or a place we can Join and be apart of this Movement? Please Email Thank you..
ToniJlove@gmail.com Love & Light Namaste. There Santo Daime as wel in Chile and Bolivia, where exactly? Th. Hello all. I also live in Portland, Oregon and am keenly interested in finding the Santo Daime church or another UdV organization that can offer guidance and wisdom on my spiritual journey. Feel free to email me at tonedef1 at gmail dot com. Thank you. There are Daime churches around all the North American areas people have asked about, but they are very low profile and do not have a presence on the web. You have to know someone who is a member in order to attend. It is the Daime belief that people who are truly “called” to Daime will find it sooner or later — like synchronistically meeting someone who is a member, just at the right time. The best way to find it may be to tune into it psychically and pray. Unfortunately, there are no Daime works happening in the UK now, because the leaders have been arrested and the sacrament confiscated. UK Daimistas can travel to the Netherlands, Spain, or Portugal (where the church is legal) to attend works. Hello. After experiencing many separate faceted lives so far in the material world I noticed a natural and growing awareness of other things along the way. I promptly sought psychiatric help for this as we do in the US as that is the only option available. I do not wish to share what I am experiencing so i tried to be brief in that summary. I simply seek to understand it. And I have sought this understanding furiously in recent years, gathering knowledge on all things in the universe quite unlike the interests of the society I was born into. Never have I sought this understanding of what I believe I see through the use of any substance and know an earlier version of myself would have been surprised that I am sure that it is exactly what I must do now. Is there someone near Sacramento that I can talk to about this spiritual practice? I do not live far from where The Church of the Divine Rose holds their meetings in Portland, Oregon, but am having no luck in finding contact information. Looking for closest available Santo Daime worship location near Houston,Tx. To put it simply I feel that I am a truly lost soul in recent day and age, I have been searching for the right path for as long as I can remember, I seek to understand the world and the universe around me. I recently discovered Santo Daime, and from what I have read it honestly sounds like the only path that makes sense to me, I live in Portland Oregon, and am aware that there is a practicing Santo Daime church here. I have searched for any contact information available, but have so far fallen victim to horrible luck, if there is anyway that you can help me get in contact with the church of the divine rose I would greatly appreciate it. Thank you for your help. I am interested in participating in an ayahuasca ceremony, I live in Austin, Texas. Austin please email me at bikesforbears@aim.com. I’ve read the wonderfully inciteful book, “Forest of Visions” by Alex Polari as is recommended before considering attending a work. I am keenly interested and have been interested for years in attending. I live near Porland, OR and notice this comment section is filling up with people (many searching for more info about Portland’s Church of the Divine Rose) who are interested in attending but are unsure who to contact in order to begin such a path. My hope is that daimistas will read our comments and respond with personal messages that are informative and helpful. For centuries, there has been a lot of curiosity about the mystical places and sacred sites of the world. The mythology about these locations is shrouded in mystery and only the very few have visited these places. For those who have seen it with their own eyes, it is unforgettable. What is our deep yearning to understand the unknowable? What is it like to walk amongst the spirits? Now, a new documentary series, four films by filmmaker Michael Wiese brings these questions into focus. The Sacred Journeys Film Festival celebrates and starts the on-going discussion about spirituality and how that is important in the Northwest with special guest speakers and discussion via Skype with the director, Michael Wiese at 10pm. The Festival takes place December 1st at 2 p.m. doors open; films at 2:30, 5:00, 6:45, and 8:30 p.m. Admission is $5 per film; $10 for entire day. At the McMenamins’ Mission Theater, 1624 NW Glisan Portland, Oregon 97209. Wiese is the only person who could bring these incredible stories to the screen. He is an American director, producer, and author. Over the past six years, he traveled to the power spots of Tibet, Peru and Bali. The Shaman and Ayahuasca: Journeys to Sacred Realms brings to light the plant Ayahuasca as a entheogentic or psychoactive vine-based plant brew and its visionary powers that has been used for healing by shamans for thousands of years. Shot in the Peruvian Amazon, “Living with Spirits: 10 Days in the Jungle with Ayahuasca” is a profoundly personal video diary of an extraordinary “dieta” rarely seen on film. Wiese made Talking With Spirits because he wanted to learn more about these dimensions awash with spirits and powerful entities so common in Bali but unheard of in the Western world. Sacred Journeys Film Festival is co-produced by Divine Arts Media and McMenamins. DIVINE ARTS Media is a new imprint of Michael Wiese Productions (MWP.com), a company that was founded by filmmaker Michael Wiese in 1976 in San Francisco primarily to produce films and publish books. The company showcases a diverse set of Arts & Culture-oriented titles within the context of spiritual seeking and being. McMenamins is a chain of 65 venues and hotels in Oregon and Washington. With McMenamins, the mundane becomes magical – depending on which historic location you choose, you may find an onsite brewery, a movie theater, a full-service spa, gardens and orchards, a winery, soaking pools, live music and more. Along with comfortable guestrooms, original artwork, restaurants and pubs, of course. Michael Wiese is available for interviews. If anyone has any information regarding ceremonies in the Austin area, I would greatly appreciate it. I live in Dallas, Texas, and I was wondering if anyone held ceremonies in the area. I live in Corpus Christi and I have been on a spiritual path for many years. I am wondering if there is a church in my area. If not what is the closest? My email is gerlamere@gmail.com. I have been a seeker all my life, and I am very interested in the church and ceremonies. Is there any in the west coast Canada, Vancouver, Victoria area?? If not, where is the nearest location? Any way of contact for more information? I see there are many other posts for people looking for a Santo Daime church in Texas. Please let me know if anyone has found anything, or any other Aya community. I am I’m Austin area, but I’m willing to travel anywhere in Texas, or even in surrounding states. Not just for a ritual, nut to join with like minded people or go as a group to the jungle to experience ayahuasca as it should be. I do not know where my path leads, it would be helpful to speak with someone or many from the church. “The UDV has núcleos – or active, practicing communities – in over 100 cities and villages throughout Brazil with a membership of over 17,000. Approximately 270 UDV members live in the United States and there are active núcleos in Colorado, New Mexico, California, Florida, Texas, and Washington. Members of the União come from all walks of life. The followers of this path include doctors, lawyers, political and business leaders, hard-working citizens and people from many diverse backgrounds all brought together with a common vision of peace. The União is a volunteer organization, with no paid positions and no history of proselytizing with respect to our faith”. Also, I was FB friends with several people from Santo Daime do Brasil – they are in Brasil only; the Uniao do Vegetal is in the USA. Please be careful, the people of Santo Daime and UDV seem nice, but don’t be taken in by random people claiming to be “shaman” from South America. I have the privilege of meeting a few chapman in my life – and first off, they don’t say “I am shaman”. They are very humble and try to meet you where you are – I have only been taught prayers and songs, and the use of some herbs to clear the way. This is a path of respect, not some crazy psychedelic trip like NorteAmericanos. It can take time to detoxify the body and mind from toxic substances even simple foods before taking the Plante. She will do the rest, but most are not ready. I am a seeker. I do not know yet if this is the right fit for me, but, searching for Divine Chirch in Portland has given me many insights about the ceremony itself will help me find my answers. I am soul searching, lost, disconnected and in dire need of healing. The Healing experience that so many have mentioned make me feel drawn to wanting to attend. However, I have found nothing about where and when, but get the impression that it may be invitation only? I had a friend who was a member years ago, before leaving Portland, and beginning a similar opportunity (temple?) in Texas, where it is not legal. Put the Church name in the subject line! Thank you.